As per the format, the first section was Reading Comprehension and Verbal Ability. Break up of questions were same as last year i.e. 24 questions of RC divided into 5 Passages as 2 passages were having 3 questions each and 3 passages having 6 questions each. There were 3 questions on Summary Writing, 5 in Parajumbles and 2 out of context questions. Second Section of 32 questions had the expected break up of 16 questions from each subsection i.e. Logical Reasoning and Data Interpretation. There were 4 sets in each subsection carrying 4 questions each. The third Section was Quantitative Ability having 34 questions spread across different concepts of Arithmetic, Algebra, Modern Mathematics and Geometry. CAT 2017, had exactly same format as CAT 2016 with a difficulty level one notch lower. 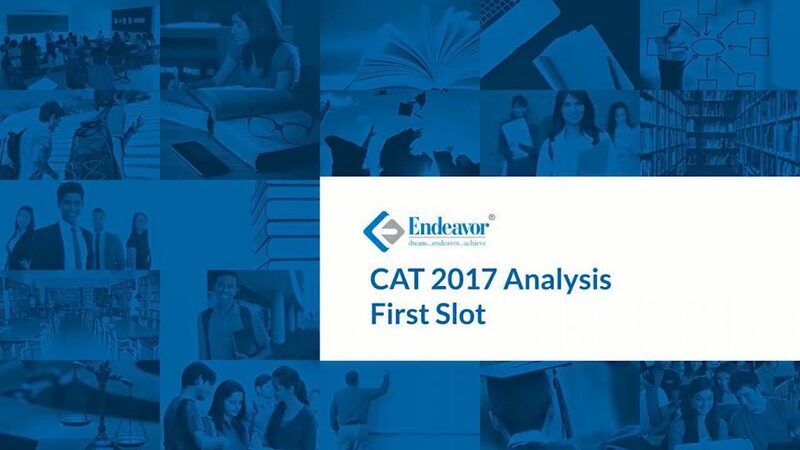 With Verbal Ability (10 questions) & Reading Comprehension (24 questions) verbal Section of CAT 2017 was a close replica of CAT 2016 with a minor change. Like last year Vocabulary based, Grammar-based, Logical Continuation & Critical Reasoning questions were missing. RCs were 5 in number: 3 RCs (450-600 words) with 6 questions each & 2 RCs (300-350 words) with 3 questions each. By the look of it, the section might be intimidating. However, this subsection can’t be called difficult. The passages were fairly contemporary spread across; Economy, Culture, Technology, Business and Finance. Out of the 24 questions, 10-12 questions were direct and hence these questions called for a lot of regression. Apart from that, 4-5 other questions were of the format: “Author would agree to all of the below, EXCEPT” which again led to back & forth reading the passages. At least 8 questions were related to main idea and conclusion of the passage. Overall, the RCs in terms of intensity of language/density or depth of the topic was light but slightly time-consuming because of the regression it called for. Verbal Ability had just 3 types of questions: Logical Discontinuity / Out of Context question (3 questions), Summary of the passage (3 questions) & Parajumbles (4 questions). Parajumbles were ‘key ins’ the problem with this being non-MCQ is that this question type became difficult because each of the Parajumbles had 5 sentences to be rearranged. Links were available, but two broken links and hence it made this part a little tricky and time-consuming. Since these questions carried no negative marking a smart test taker will be able to attempt them with 75% accuracy. Out of Context was non-MCQ variety but this can be called “pseudo non-MCQ” because it was more like keying-in a number instead of marking an option. Out of context questions comprised 5 sentences. They were easy in difficulty level hence they should not have been missed. This section seemed to be toughest, though on the line of expectation but attempting more than 21 question would have been difficult. Two sets, Burger scheduling and 5 x 5 matrix of pillars were doable otherwise 3 sets in LR and 2 sets in DI can surely be considered as time-consuming. Specifically set on Happiness Index, Set on marks in PCM with percentiles, School going students and set based on Flights were deceptive enough to engross students in it without scoring marks. Overall, Attempting 16+ questions with 80% accuracy can be considered for a good score. Overall, again LR/DI section may become a bottleneck for most of the students. Though, this section was expected to be tough, but handling newer varieties of question is always difficult. Moreover, a lot of sets were time-consuming and hence, it would not have been easy to skip sets. Surprisingly, this section turned out to be easier than expected. Nearly every chapter had a representation Percentages, Profit & Loss, Linear Equations, Quadratic Equations, Inequalities, Surds & Indices, Averages & Partnership, Time & Work, Time & Distance, Alligations & Mixtures, Permutation & Combination, Inequalities, Triangles, Polygons, Circles, Area & Volume, Coordinate Geometry and the list goes on. The only shock was an absence of questions from Number system. Below mentioned is the unit wise description of the same. With around 4 questions in the paper difficult, a third of the section easy and remaining moderate, the spread of the questions was good. and actors involved. But what about the marketing angle? Rs. 500 if your response is the best one and if you send it by 2nd December.